Senior staffers were sworn in at a ceremony in the East Room of the White House on Jan. 22, 2017. Many of them are gone now. Kellyanne Conway, counselor to the president, has a picture of senior staff being sworn in framed on her office wall. She calls it a reminder of "durability and toughness and longevity" of those who are still there. White House social media director Dan Scavino is called "the man behind the mission — the mission of this president to communicate directly with America." There had been speculation that Trump son-in-law Jared Kushner and Trump daughter Ivanka Trump might give up on Washington, but now insiders are saying they are in it for the long haul. 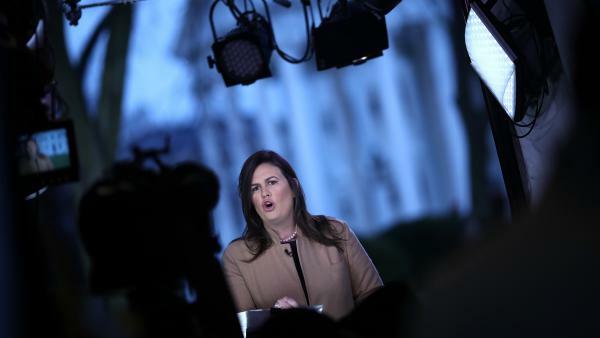 White House press secretary Sarah Sanders says the senior staffers who remain "really believe in what we are doing and believe that we're making a difference." On the second full day of the Trump presidency, all of the top White House aides gathered in the East Room to be sworn in by Vice President Pence. They raised their right hands and swore to defend the Constitution. Kellyanne Conway, counselor to the president, has a picture from that day blown up and framed on her office wall. There are familiar faces from the early days of the Trump White House: Reince Priebus, Steve Bannon, Sean Spicer, Hope Hicks, Omarosa Manigault Newman, Tom Bossert and Don McGahn. They are all gone now, along with many others who took the oath that day. "In the photo are 7 or 8 different faces of assistants to the president who have moved on or are no longer here," she said. "They were either fired or forced out or resigned voluntarily. And I've had the picture up basically from Day One, but as each one left, it became a running joke of those remained." Former White House counsel Don McGahn was the last one to go, and he wrote Conway a note telling her she could take the picture down. But she isn't sure she will. "It's a good reminder of where we started and where we are and the durability and toughness and longevity that some of us have," she said with pride. The Trump White House has set records for staff turnover. But rather than close out the year remembering those who are gone, we decided to take a look at those who survived. Conway is one of the survivors. Others who started in the initial days and are still there include presidential son-in-law and adviser Jared Kushner and senior policy adviser Stephen Miller. They were there in the photo on Conway's wall, but because of the angle it was shot from, they were obscured from view by the lectern. 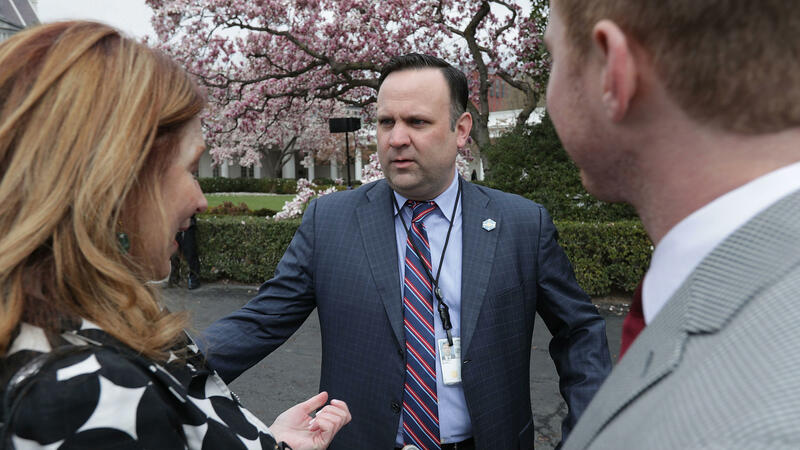 Press secretary Sarah Sanders, social media director Dan Scavino and Johnny DeStefano, who started as personnel director and now wears several hats, are all survivors as well. Miller, Sanders and Conway are unbroken threads from the campaign. Scavino, the social media director, goes back even further. He worked as a caddie at one of Donald Trump's golf courses when he was a teenager. Now he sits in the tiny office just feet from the Oval Office where trusted aide and former communications director Hope Hicks used to sit. "He occupies such a unique role and such a trusted role," said Conway. "He really is the man behind the mission — the mission of this president to communicate directly with America." Or as former campaign adviser Barry Bennett put it: "They share thumbs. They complete each other's tweets." Scavino may be like family. But Kushner actually is family, married to President Trump's daughter Ivanka (who didn't get a formal White House job and title until March 2017). Kushner just helped push through criminal justice legislation, was part of negotiations on the new trade deal with Mexico and Canada and most recently was seen up on Capitol Hill trying to negotiate a solution to the partial government shutdown. "Jared has a very quiet demeanor that belies an incredibly strong will and robust intellect," Conway said. 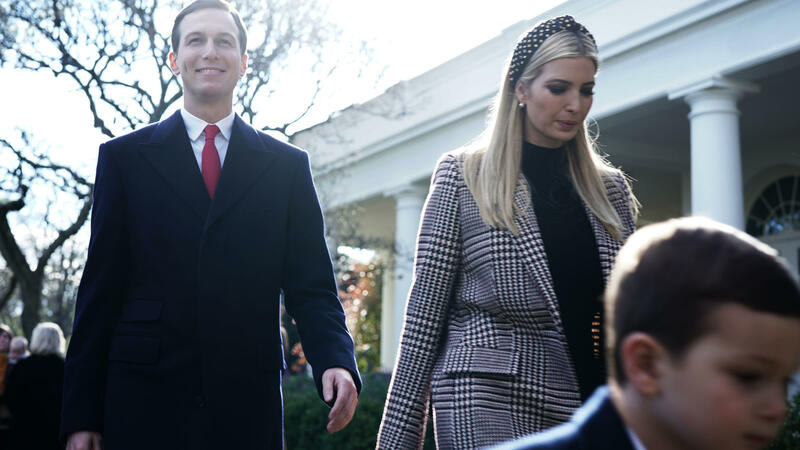 For a while, there was speculation that Kushner and Ivanka Trump might give up on Washington, but now insiders are saying they are in it for the long haul. "You can lose your title, but you're never going to lose being the daughter or the son-in-law," said Bennett. Johnny DeStefano is a White House aide you've probably never heard of, and that likely has something to do with his staying power. "He keeps his head down and stays out of the constant internecine combat in the press that seems to be a feature of the Trump administration," said Michael Steel, a partner at Hamilton Place Strategies who worked with DeStefano in former House Speaker John Boehner's office. DeStefano is an experienced Washington hand, which sets him apart from many in the Trump White House, who came from the business world and lacked government experience. "He is a smart guy who is going to do his work and has no interest in being on cable news, has no interest in reading his name in the newspaper," said Steel. "He is a serious and hardworking public servant. That shouldn't be a distinguishing feature, but in this administration, it seems to be." What do all these aides have in common? "Endurance," said Marc Lotter, with a laugh. Lotter was Vice President Pence's press secretary early in the administration. He's now part of the 2020 campaign advisory committee. And he's only sort of joking about the endurance thing. "[President Trump] wants his staff people debating. He wants to see the bad side arguments from one side and the good on the other," said Lotter. "And he's going to pit them against each other. But when he makes the decision, your job is to go out and execute." Which is to say: The survivors have a high tolerance for conflict and, in the end, will do or say what Trump asks — something outgoing Defense Secretary Jim Mattis ultimately wasn't willing to do. 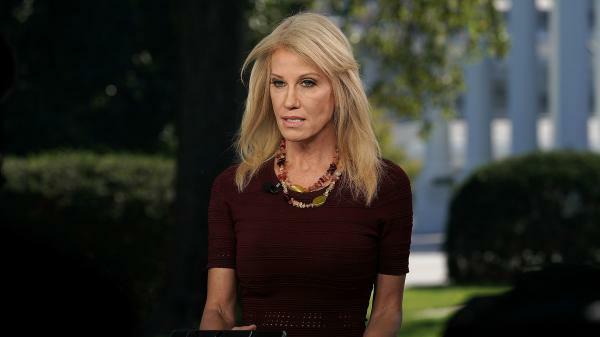 Conway says she has advised colleagues that if working in Trump's White House is more of a burden than a blessing, they should move on. Press secretary Sarah Sanders, who started as a deputy and was elevated in one of the earlier staff shake-ups, offered that a key to longevity is loving Trump and his agenda. "The people that are here really believe in what we are doing and believe that we're making a difference and we're proud of the work that we do every day," she said in an answer that is exactly what you would expect the president's top spokesperson to say. In the process of reporting this story, a question arose: Would it be out of date before being published? Would there be another visitor to the busy White House departures lounge? "Not that I know of," said Sanders. "Certainly don't think so and don't hope so." It's looks as if she was right. The Trump White House is setting records for staff turnover. UNIDENTIFIED REPORTER #1: Yet another bombshell shakes the foundation of the Trump administration. UNIDENTIFIED REPORTER #6: Forced out after a short and stormy tenure at the White House. UNIDENTIFIED REPORTER #7: Reince Priebus is out as White House chief of staff. UNIDENTIFIED REPORTER #8: His chief of staff, John Kelly, is leaving the White House by the end of the year. KING: But as the year winds down, rather than look back on who is gone, NPR's White House correspondent Tamara Keith has this look at who survived. 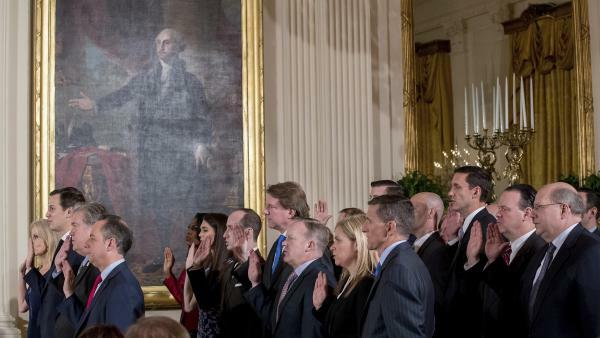 TAMARA KEITH, BYLINE: On the second full day of the Trump presidency, all the top White House aides gathered in the East Room to be sworn in by Vice President Pence. VICE PRESIDENT MIKE PENCE: I - state your full name. KEITH: They raised their right hands and pledged. UNIDENTIFIED WHITE HOUSE AIDES: Do solemnly swear. PENCE: That I will support and defend the Constitution of the United States. KEITH: Most of them are gone. But not counselor to the president, Kellyanne Conway. When I sat down in her office to interview her, she pointed out a large framed photograph on the wall taken that day, January 22. KELLYANNE CONWAY: In the photo are seven or eight different faces of assistants to the president who have moved on or are no longer here, were either fired and forced out or resigned voluntarily. And I've had the picture up basically from Day 1, but as each one left, it became a running joke of those who remained. KEITH: Former White House counsel Don McGahn was the last one to go, and he wrote Conway a note, telling her she could take the picture down. But she isn't sure she will. CONWAY: It's a good reminder of where we started and where we are and the durability and toughness and longevity that some of us have. KEITH: Conway is one of the survivors. Others who started on Day 1 and are still there include press secretary Sarah Sanders, presidential son-in-law and adviser Jared Kushner, senior policy adviser Stephen Miller, social media director Dan Scavino and Johnny DeStefano, who started as personnel director but now wears several hats. He's the one you've probably never heard of. DeStefano is an experienced Washington hand who worked for former House Speaker John Boehner, among others. Michael Steel worked with him in Boehner's office. MICHAEL STEEL: He is a smart guy who's going to do his work and has no interest in being on cable news, has no interest in reading his name in the newspaper. He's a serious and hard-working public servant. That shouldn't be a distinguishing feature, but in this administration, it seems to be. KEITH: Miller, Sanders and Conway are unbroken threads from the campaign, and Scavino, the social media director, goes back even further. He worked as a caddy at one of Trump's golf courses when he was a teenager. CONWAY: He occupies such a unique role and such a trusted role. CONWAY: He really is the man behind the mission, as - the mission of this president to communicate directly with America. KEITH: Scavino may be like family, but Kushner actually is family. He just helped push through criminal justice legislation and most recently was seen up on Capitol Hill trying to negotiate a solution to the government shutdown. So what do all these people have in common? KEITH: Mark Lauder was Vice President Pence's press secretary early in the administration. He's now part of the 2020 campaign advisory committee, and he's only sort of joking about the endurance thing. LAUDER: He wants his staff people debating. He wants to hear the bad-side arguments from one side and the good on the other, and he's going to pit them against each other. But when he makes the decision, your job is to go out and execute. KEITH: Which is to say the survivors have a high tolerance for conflict and, in the end, will do or say what President Trump asks, something outgoing Defense Secretary James Mattis ultimately wasn't willing to do. I asked Sarah Sanders what she thinks she and her fellow survivors have in common. SARAH HUCKABEE SANDERS: The biggest thing is that the people that are here really believe in what we're doing and believe that we're making a difference, and we're proud of the work that we do every day. KEITH: That's exactly what you'd expect the president's top spokesperson to say. Before our quick interview was over, I felt I had to ask her an awkward question. And I did so awkwardly. All right (laughter). Is anybody on this list going to leave before my story airs? SANDERS: Not that I know of - certainly don't think so, don't hope so. KEITH: It looks like she was right. Tamara Keith, NPR News, the White House. Transcript provided by NPR, Copyright NPR.